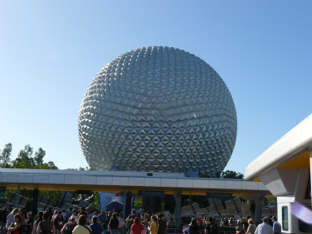 Today we were off to the world famous Epcot Center - not to be confused with the slightly less famous Epcor Center. 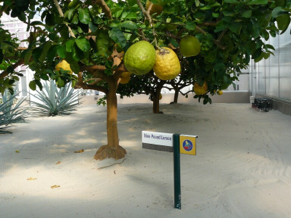 Epcot is known for the World's Biggest Golf Ball (pictured above) as well as nine pound lemons (pictured below). Epcot is a completely different theme park from the rest of Disney, with less focus on rides and more on food. The highlight was undoubtedly the international food kiosks where we sampled food from around the world - including seared cheese with honey and pistachios from Greece, several shrimp dishes from Australia, Mexico and China, and some fantastic chocolate creme brûlée from France. But there were rides. We did Soarin', the hang-glider simulator, the Fast Track car course (which was amazing and also an hour long wait) and a couple of others. But today was really about the food. Yummy! We left Epcor mid-afternoon and headed to Downtown Disney to do our Christmas shopping and walk around. 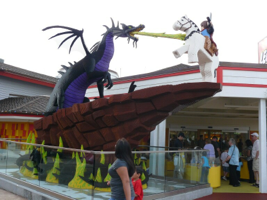 The Lego store was really cool. No, kids, we didn't buy anything there. And then it was back to our resort for a quiet night of relaxing. We've been go-go-go since Sunday and it's nice to have some down time before heading back to one of the parks tomorrow.